If you write it, they will come. The “it” in this case is the human genome, and the “they” are biomedical researchers and drug developers in need of cell lines resistant to viruses, cancer, or damage from aging, freezing, and radiation. Such cell lines would be “ultra-safe,” suggest participants in the Genome Project-write (GP-write). To render cells ultra-safe, and thus simpler and less expensive to maintain, GP-write intends to lead a community-wide recoding project. Essentially, recoding involves removing from genomes both redundant codons and the translational elements needed to decode these codons. 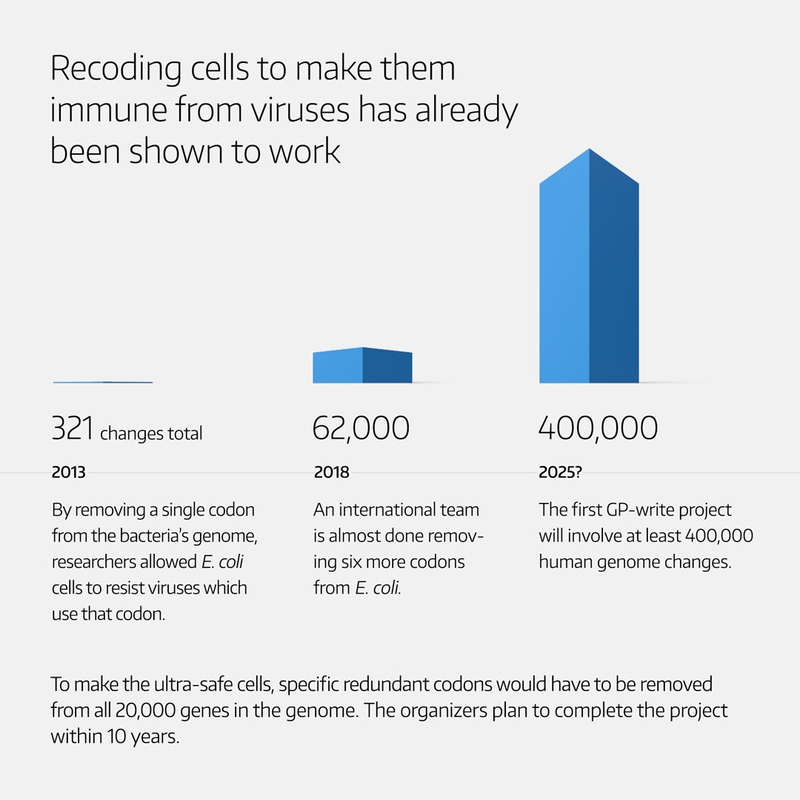 At present, recoding work on the E. coli genome continues, making progress toward a further 62,000 changes that would impart complete viral resistance. A comparable effort on a human cell line would require that at least 20,000 genes be subjected to at least 400,000 revisions. According to GP-write, this effort could be completed in 10 years. While difficult, and requiring the development of technology that does not yet exist, the creation of ultra-safe human cells would be worth the effort, GP-write insists. “Ultra-safe cells could have a major impact on human health,” Church explains. For example, some medicines are manufactured in specialized cellular factories. Viruses can contaminate the cells, in one case causing an estimated $1 billion in losses and cutting off patients from their medicine. Because of the risk, companies must undertake costly monitoring for viruses. Besides increasing virus resistance, large-scale recoding could make cells less likely to become cancerous, or enable cells to resist damage from aging, freezing, and radiation. 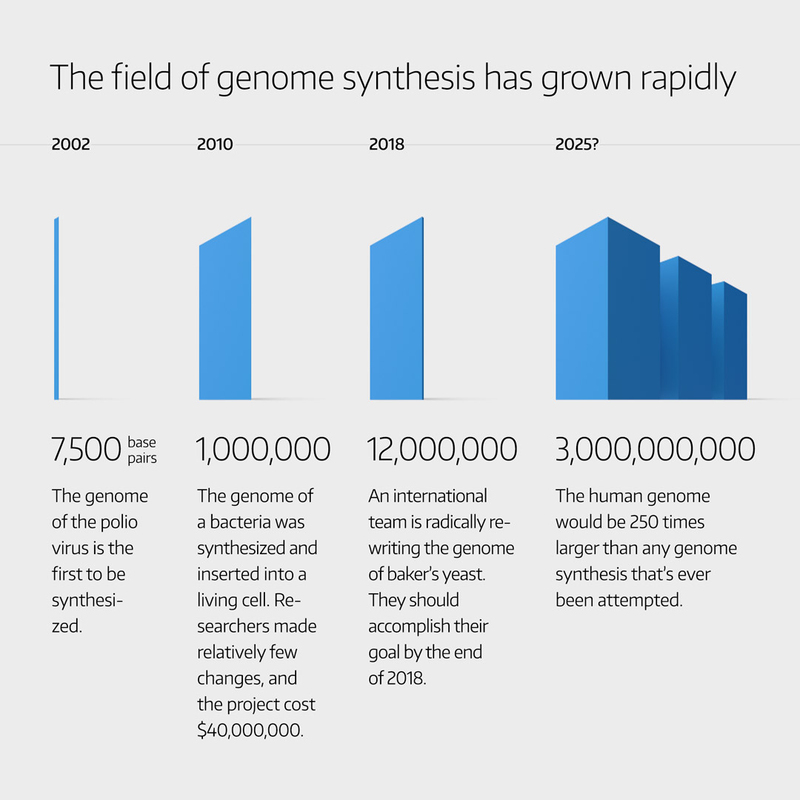 Another proposed benefit of the ultra-safe cell line, and GP-write more broadly, would be the commercial development of new genomics analysis, design, synthesis, assembly, and testing technologies, with the goal of making these technologies affordable and widely available to the scientific community. The recoding work that is underway is focused on DNA’s three-base codons, each of which corresponds to an amino acid building block. For example, the triplet GGC represents the amino acid glycine, TTA represents leucine, GTC represents valine, etc. Because there are 64 possible codons but only 20 amino acids, many of the codons are redundant. For example, four codons can each stand for glycine: GGT, GGC, GGA, and GGG. If you replaced a redundant codon in all genes (or “recode” the genes) and removed the transfer RNA (tRNA) machinery that decodes it, the human cell could still make all of its proteins. But viruses—whose genes would still include the redundant codons and which rely on the host cell machinery to replicate—would not be able to translate their genes into proteins. Viruses trying to replicate would instead get snuffed out—as a result, the recoded cells would be immune. Recoding human cells will require significant improvements to technology for synthesizing and testing artificial genomes. In gene synthesis, DNA nucleotides are biochemically stitched together one at a time. The result is similar to natural DNA, but the process is currently very slow. By driving innovation and increasing demand, GP-write hopes to make this process faster and cheaper. 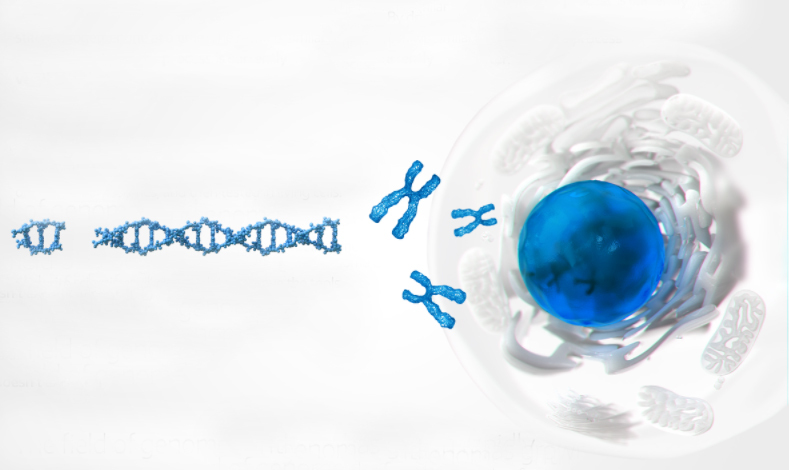 After synthesis, the DNA can be assembled into genes or entire chromosomes and then tested in living cells. GP-write scientists will also work to improve the tools for genome assembly and testing, but in some cases, the technology doesn’t exist yet. By developing the technology, GP-write may succeed in realizing its petri dish of dreams. This year the participants aim to complete the radical rewriting of the 12-million base-pair genome of baker’s yeast (Saccharomyces cerevisiae). In comparison, the human genome has 3 billion base pairs in one set of chromosomes.